VEVO to Host Two Free CMA Fest Shows at 12th & Porter! 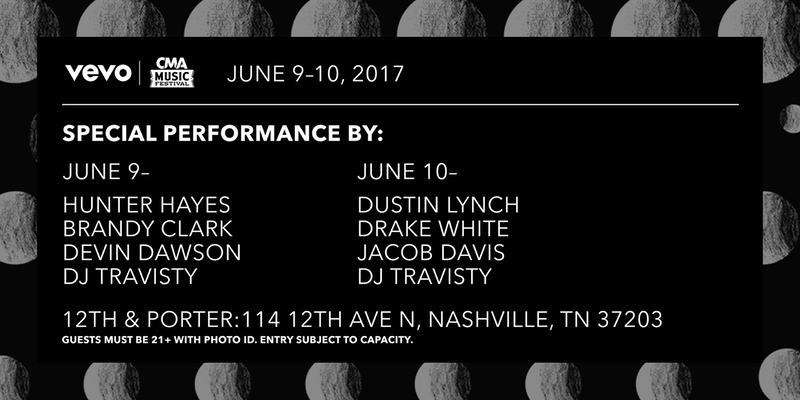 VEVO will be holding two awesome shows at 12th & Porter during the 2017 CMA Music Festival! Night one (Friday, June 9th) will feature Hunter Hayes, Brandy Clark, and Devin Dawson, while Dustin Lynch, Drake White, and Jacob Davis take the stage on night two (Saturday, June 10th)! Admission to these two amazing shows is first come, first served for those with tickets. Having tickets does not guarantee entry though so get there early!